The final day of Birdfinders spell in Israel began with another sojourn into the Eilat Mountains. A strong northern blew down the Arava Valley which seemed like promising conditions for a good migration of raptors. Surprisingly, our arrival in the mountains was greeted by fairly light and variable winds, and it appeared that wind strength and direction in the valley below must have been highly localized. Even so, we experienced a fine passage of raptors with birds passing northwards across a broad front. Eventually we settled at Netaphim Crossing where we had many close passing Steppe Buzzards and Black Kites, with some Black Storks and Steppe Eagles, and a smattering of Long-legged Buzzards and Egyptian Vultures. It's never too late to pick up new species for the tour, and on this morning we bagged our first Osprey and and Lesser Spotted Eagle of the trip. A small flurry of swifts was composed of all four possible species in Israel (Common, Pallid and Alpine) including our fourth Little Swift of the trip in what had been a stellar tour for that species. Birdfinders at Netaphim Crossing, Eilat. March 25th, 2013. Ein Netaphim - looking East towards Jordan. March 25th, 2013. Steppe Buzzard - gray-brown morph, Ein Netaphim, Eilat. March 25th, 2013. We bade farewell to Eilat and set sail for Tel-Aviv and the flight home. The drive across the desert was enlivened by a constant search for roadside Eastern Mourning Wheatears and we eventually connected with several deep inside the Ramon Crator. After that, every gas station or coffee stop was peppered with new birds for the trip - Eurasian Griffon Vulture at See Boker, and Stone Curlew, Eurasain Jackdaw, Eurasian Jay and Common Myna near Hulda Junction (along with a Syrian Woodpecker!). As always, spring in Southern Israel had produced a fascinating two weeks. Each week was tempered by some incredible highs and a few lows, and both weeks had been remarkably different in content, especially considering that each was composed of the same basic tour. I'm already looking forward to going back in November! Our last full day in Eilat (March 24th) was spent chasing a couple of ghosts, namely a probable Sooty Gull seen off Eilat's north beach on March 22nd and two Menetries's Warblers found by Barak Granit at Km20 Acacia scrub on the 23rd. In the event, we didn't come across either species but in the process, as so often happens in Eilat, we found other interesting birds along the way beginning with a (or the) White-cheeked Tern with Common Terns on the north beach in the morning. White-cheeked Tern - (2nd from right) with Common Terns, Eilat North Beach, March 24th, 2013. Presumed continuing first-summer bird from March 22nd. Exceedingly rare before mid-April, the earliest spring record documented in the 'Birds of Israel' being April 10th, 1989. This bird was a totally unexpected find for our Birdfinders group on a March trip to Israel. Despite a good team effort, we found no certain Menetries's Warblers at Km20 though we did have brief views of a good candidate. However, far from being a wasted effort, we did come across several new species for the tour including two Siberian Stonechats and a really fine Great Reed Warbler. A Savi's Warbler was also heard singing but refused to give itself up and remained hidden in the same dense thicket as the Great Reed Warbler pictured below. Great Reed Warbler - Km20, Eilat. March 24th, 2013.
Who would think of going to the desert to get views like this of reed-bed skulkers? Siberian Stonechat - male, Km20, Eilat. Siberian Stonechat - female, Km20, Eilat. Common Nightingale - skulking but viewable. Km76, Yahel, Eilot region. March 24th, 2013. Cretzschmar's Bunting - Km76, Yahel, Eilot region. March 24th, 2013. A tricky looking bird, presumed to be a first-spring female, with whitish throat and pale buff malar. We later drove north and spent the remainder of the day at Km76 just north of Yahel. This proved to be a good move as the area was alive with migrants including numerous Eastern Orphean Warblers, Ehrenberg's Redstart, Wryneck and our first Common Nightingales and Bimaculated Larks of the tours. Towards dusk two harriers began hunting the many tens of Short-toed Larks present. One of them was a clear male Pallid but the second, an immature bird, looked better for an early Montagu's to me. Sadly, distance and brevity meant that this bird remained unidentified and never made it onto our final tally. Pharoah Eagle-owl - Hazeva. March 23rd, 2013. First views of a very cool find by Birdfinders tour participant David Coker. The bird soon retreated to a more distant, but rather more open Acacia giving us breathtaking scope views. Just one highlight from a staggeringly brilliant day trip to the Dead Sea which included a pair of Arabian Warblers feeding fledged young at Hazeva, a pair of Hume's Owls together spotlighted while 'dueting' in a remote wadi, and excellent flight views of a Nubian Nightjar in the Southern Dead Sea. Migration during the day included over 300 Common Cranes at Hazeva, and Blue-cheeked Bee-eaters (3) and a Collared Pratincole at Neot Hakikar, all heading north and all new to the tour week. Another stellar day including more raptor migration in the Eilat Mountains along with a superb male Hooded Wheatear. Ein Evrona had quite a few migrants including numerous Eastern Bonelli's and Ruppell's Warblers, with mammalian highlights including Dorcas Gazelle and a couple of Cape Hares. In the afternoon we spent time in the beautiful Yotvata dunes where we eventually tracked down a singing male Hoopoe Lark, probably the same bird that eluded our first group last week. Migrant wheatears were plentiful here with over 25 birds in total including Isabelline, Northern and Black-eared Wheatears, plus a couple of challenging birds that couldn't be determined, one of which may have been a female Pied Wheatear. We finished off the day at Eilat's north beach where we found a gentle southern breeze coming in off the sea. New birds for the tour included Baltic and White-eyed Gulls, Gull-billed, Sandwich and Common Terns, Arctic Skua (two heading north), Purple Heron (nine migrants high overhead), and three Pied Kingfishers - not too shabby! March 22nd - Birdfinders had a spectacular day in and around Eilat. Warm winds from the south kicked up sandstorm conditions north of Eliphaz so we concentrated on the Eilat area beginning with a short session at the North Beach. Three Arctic Skuas and five Common Terns hinted at the possibilities to come and we vowed to return later in the afternoon. In the mean time we spent time on the canal zone south of Km20, eventually finding our much sought after Dead Sea Sparrows. The canal area was actually alive with quality birds and within an hour we'd notched up Eastern Imperial Eagle (2nd cal-year), Spotted and Little Crakes, Citrine Wagtail and Indian Silverbill. Late afternoon found us back at the North Beach finding an extra-ordinarily early White-cheeked Tern among increased numbers of Common, Sandwich and Caspian Terns. We hadn't been there long when news filtered through of a Caspian Plover at Km20 leaving us little choice but to go for it. We finished off an amazing day with stunning pair of Lichtenstein's Sandgouse coming into a drinking hole at dusk. Late afternoon at Km20 - birders twitching the first Caspian Plover of the spring. Caspian Plover - male, K20, Eilat. White-cheeked Tern - first summer with Sandwich Tern (left) and Common Tern (right). Lichtenstein's Sandgouse - female at dusk, Eilat. 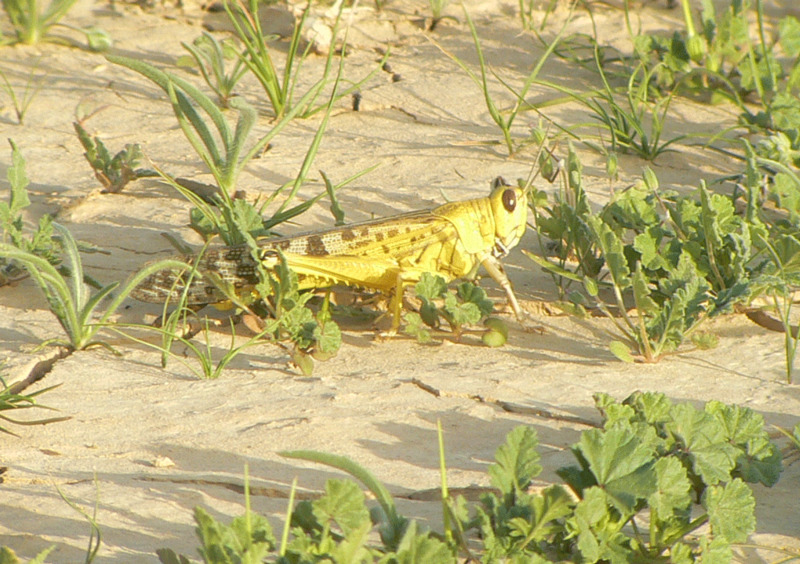 Lichtenstein's Sandgouse - male at dusk, Eilat. Citrine Wagtail - male, Km20/19, Eilat. Little Crake - female, Km20/19 canal zone, Eilat. Spotted Crake - Km20/19 canal zone, Eilat. The air was filled with the pulse of migration today. We began in the Eilat Mountains with a steady migration of Black Kites, Steppe Buzzards and Steppe Eagles (30+) over Wadi Shlomo along with several small flocks of Black Storks. Below us, White-crowned Black Wheatear and Blackstart fed in the local campground. Common, Pallid and Alpine Swifts all filtered through the mountains throughout the morning. At Km20 salt pools the sky was full of hirundines including large numbers of Red-rumped Swallows and Sand Martins. Several Dead Sea Sparrows could be heard singing but wouldn't give themselves up for the group but the real highlight here was a continuing White-tailed Lapwing, almost certainly the same bird that we saw last week with the first group. After lunch we tried for another of last week's rarities - the Black Bush Robin at Neot Smadar which put on a fine display once more. We finished a superb day at Km77 north of Yahel, where once again we found the 'green desert' extremely birdy. The area contained many Isabelline and Northern Wheatears with a few Black-eared, plus Asian Desert Warbler, Lesser Ketrel (first-summer male) and a fantastic flock of 25 Pale Rock Sparrows. In many respects it was a perfect introduction to the joys of birding in and around Eilat in spring. Black Bush Robin - Neot Smadar, Eilot region. Not quite as bold as we experienced last week. Pale Rock Sparrow - Km77, near Yahel, Eilot region. One of a flock of 25. Short-toed Eagle - in migration, Eilat Mountains. Black-crowned Night-herons - in migration, Km20 salt pools, Eilat. White-tailed Lapwing and Black-winged Stilt - Km20 salt pools, Eilat. Back in Eilat with a new group hoping for a good week. We had three excellent days in the Negev with highlights including McQueen's Bustard, Cream-colored Courser, Asian Desert Warbler, Syrian Serin and several male Pallid Harriers. Here's a few images from the Negev, plus a few from the Dead Sea last week with our first group. Woodchat Shrike - Nizzana, Western Negev. Hooded Wheatear - Ein Netaphim, Eilat Mountains. Bonelli's Eagle - adult, Wadi Mishmar, Dead Sea region. Desert Finch - male, Mizpe Ramon, Central Negev. Asian Desert Warbler - (rear) with out-of-focus Isabelline Wheatear in foreground. Nizzana, Western Negev, March 18th, 2013. Desert Little Owl - Ze'elim, Western Negev. Striolated Bunting - Ein Gedi, Dead Sea region. Syrian Serin - Mizpe Ramon, Central Negev. 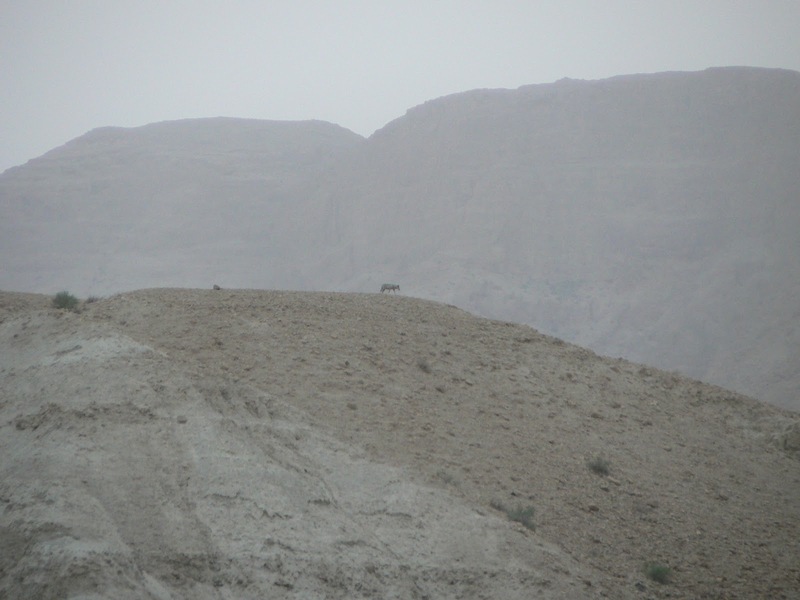 Chuckar and Nubian Ibex - Mizpe Ramon, Central Negev. Wolf - Wadi Mishmar, Dead Sea region. At last a break in the weather with much cooler conditions and noticeable upswing in the tempo of migration beginning with a beautiful young Pallid Harrier at Km19. Yotvata dunes had a flock of 15 wheatears containing three species - Isabelline, Northern and Black-eared. Once again we heard, but did not see, a singing Hoopoe Lark! Whilst at Yotvata we got news of a Black Bush Robin at Neot Smadar sewage pools and found oursleves there just after lunch. The bird, found by a visiting Finnish couple, put on an extra-ordinary show and was in view as soon as we arrived. After we'd had our fill of the bush robin we headed north to meet up our guide for a night excursion for Nubian Nightjar. Along the way we checked a remote Acacia wadi in the Hiyyon Plains finding a range of desert species and a surprising number of migrants including several Orphean Warblers and Black-eared Wheatears. Totally unexpected here was a male Arabian Warbler, my first in ten years of visits to this particular wadi and not a place where I'd even suspected the species might occur - a nice surprise to the say the least! Arabian Warbler - Hiyyon Plains, Eilot Region, March 16th, 2013. We finished off a brilliant day with stunning flight views of Nubian Nightjar at Neot Hakkikar courtesy of our guide Barak Granit. Trumpeter Finch - Neot Smadar, Eilot Region, March 16th, 2013. Another hot day, especially in the early part of the afternoon. We began the day in Holland Park on the north side of Eilat finding a few sylvia warblers including about 5 Orphean and 3 Ruppell's Warblers. But it was really the local desert species that provided most excitement for our group with Sand Partridge, Blackstart and Arabian Babbler all giving excellent views. Afterwards we moved onto the salt pools at Km20 where we found 2 of the previously reported Greater Sandplovers straight away. The salt pools seemed to have received good numbers of new birds, including Marsh Sandpipers (15) and two exceptionally smart Gull-billed Terns. We also found Black-tailed Godwit and Red-necked Phalarope. Thanks to a tip from Itai Shanni we found ourselves in Yotvata by early afternoon where we spent the hottest hours of the tour so far watching larks on the fringe of the Yotvata dunes. It didn't take us too long find the reported Bimaculated Larks (3) amongst some 150 Greater Short-toed Larks. Unfortunately for our group, I was the only person to hear a Hoopoe Lark singing. The rest of the afternoon fizzled a little as we tried for desert species at the oft-productive Ovda Valley, only to find the place virtually deviod of birds. Even so, despite yet another day of extreme heat, we felt pleased with our results for the day. Sand Partridge - Holland Park, Eilat. Greater Sandplover - Km20, Eilat. Gull-billed Terns - Km20, Eilat. Bimaculated and Greater Short-toed Larks - Yotvata dunes. Birding in the southern Arava was tougher than expected today. Heat and wind again featured throughout the day and migrants between Eilat and Yotvata appeared to be in very short supply indeed. We fared better in the afternoon when we tried an area of 'green desert' just to the north of Kibbutz Yahel, about an hour north of Eilat. On arrival, a dozen Spotted Sandgrouse flew over heading north. Initially, wheatears appeared to be the most obvious migrants with Isabelline, Northern and Desert Wheatears being found within a few minutes. Further exploration of the plains produced numerous Tawny Pipits, Greater Short-toed Larks, Lesser Whitethroats and a dozen Cretschmar's Buntings. The highlight would have to be the Pale Rock Sparrow picked out by group participant Neil Maxwell, a bird which we all saw extremely well. Towards the end of the day we also found a nice range of migrants including Common Whitethroat, Ruppell's and Orphean Warblers plus a Wryneck, wrapping up an extremely productive afternoon. Cretschmar's Bunting - Km77, Eilot region, Israel. March 13th, 2013. Pale Rock Sparrow - Km77, Eilot region, Israel. March 13th, 2013. Tawny Pipit - Km77, Eilot region, Israel. March 13th, 2013. Desert Locust - Km77, Eilot region, Israel. March 13th, 2013. Eilat, Israel - great first day!